Today at the Tizen Developer Summit in Korea, Samsung revealed their first product powered by the Tizen platform. Interestingly, it’s not a smartphone or a TV but in fact, it’s a camera and its been selling in South Korea for sometime. 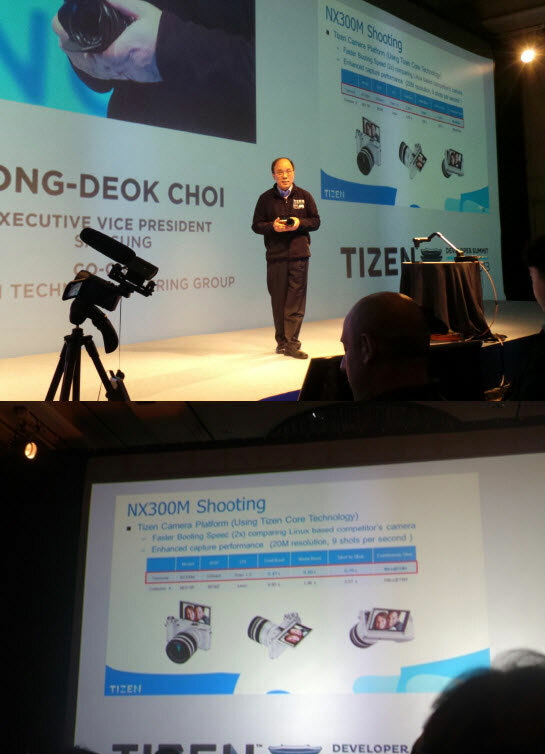 We’re referring to the NX300M that uses Tizen Camera Platform. This platform uses core Tizen technology and results in faster booting speed (up to two times faster) and improved camera performance. Samsung also threw some light on Tizen powered smartphones, which will be released in the first quarter next year. These devices will run Tizen 2.2.1 but has a likeliness to be upgraded to the Tizen 3.0 when it arrives in Q3 2014. Tizen 3.0 will bring support for multi-user accounts, 64-bit architecture support, better 3D rendering engine and more.